People are fleeing their homes and traveling in small boats across the Mediterranean Sea to reach the shores of Europe. So far this year, around 300,000 men, women, and children have made this crossing, seeking asylum in European countries. Because they are leaving their homes and migrating to other countries, many media outlets are referring to them as "migrants." But according to the UN and a number of human rights activists, most of these people count as refugees, not migrants. Why should we use the term "refugee" instead of "migrant" when we talk about the people crossing the Mediterranean? There are important legal and social reasons behind the phraseology. Legally speaking, a refugee is someone who has fled his or her country "to escape war or persecution, and can prove it," according to The New York Times. Many of the people who have crossed the Mediterranean were from Syria, Afghanistan, or Eritrea. 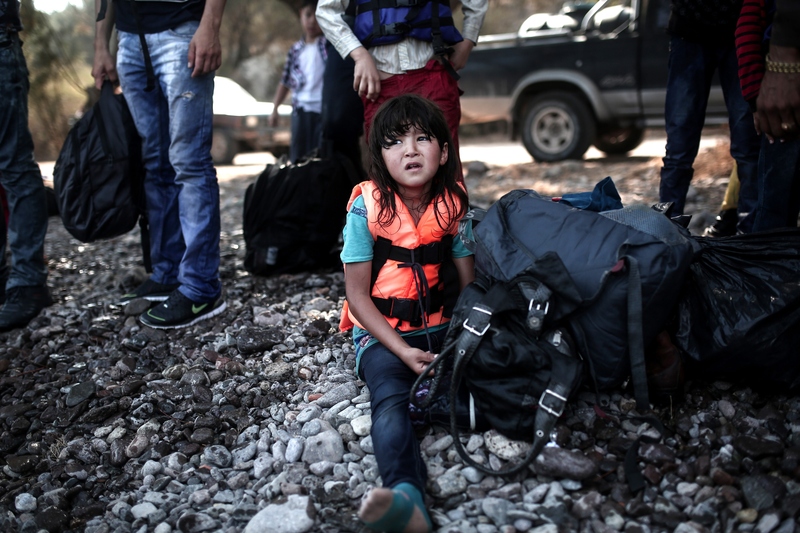 Syrians are usually referred to as refugees because they are fleeing the civil war there. Many Afghans are also fleeing conflict, and Eritreans can easily argue that they would face political persecution in their country, which is ruled by a regime with a human rights record of torture, disappearances, forced labor, and sexual violence. Migrants are people who are leaving their country for reasons other than persecution or war. For example, perhaps they cannot find jobs in their home country — which is common in sub-Saharan Africa. But even that description undersells the plight of migrants, who could be fleeing dire poverty or the effects of climate change on their homes. There is a recent debate emerging about whether those fleeing the effects of climate change should be reclassified as refugees. Why is this distinction so important? It's crucial because refugees are often seeking the asylum granted to them by the UN's refugee agency. By law, refugees cannot be sent back to their home countries. But migrants can be deported. Therefore, many European politicians prefer to call everyone crossing the Mediterranean "migrants" so that they don't have to admit them into their countries. The term migrant does not properly describe the horror currently unfolding in the Mediterranean. Nor does it properly describe these people’s motivation for risking their lives to cross the sea or try to pass under the channel tunnel. It dehumanizes. Only by saying what it really is, a Refugee Crisis, can we have any hope of understanding the issue and finding a real, long-term and humane solution. The analogy I’m using to determine (whether we help refugees and migrants) is: would we find acceptable that our sons and daughters be treated the same way if they were in the same circumstances? If we answer no, then we have the answer to our moral dilemma. Most of the people traveling across the Mediterranean legally qualify as refugees, and as such, they deserve asylum. But even migrants deserve to try to find a better life in a new place.